﻿ News Bharati - Modi's sway to release the nation of a hung parliament..! News Bharati - Modi's sway to release the nation of a hung parliament..! Modi's sway to release the nation of a hung parliament..! Surat, January 30: “While other governments make excuses about how it’s difficult to take decisions in a coalition government, we have shown how a majority government can work”, said PM Narendra Modi while addressing the sea of people at Surat in Gujarat today. “For the last 30 years, the country had a hung Parliament due to which progress was affected. But four years ago, people voted to give full majority after which the country is progressing rapidly”, he added. The Minister was addressing a gathering after laying the foundation stone for extension of the new terminal at Surat airport. 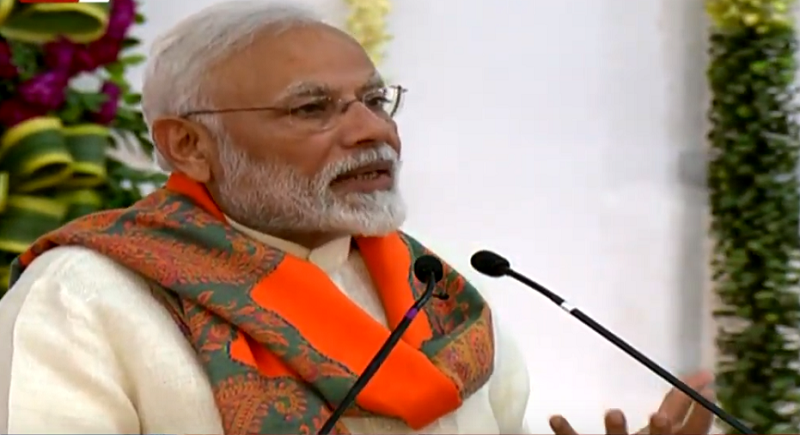 Crediting the government's demonetisation decision for bringing down prices of houses and making them affordable for the aspiring youth, PM Narendra Modi said that if the previous governments had to do the work that he has done so far, they would have needed 25 more years for it. Modi also inaugurated the Smt Rasilaben Sevantilal Shah Venus Hospital in presence of the state CM Vijay Rupani. “Not only in jewellery and textile sector, but now Surat is ahead in all other sectors. Surat has always hailed the values put up by the father of nation, Mahatma Gandhi. The educated youth in the city have completely involved themselves in the social work. These things turn up to building the make in India concept robust”, he claimed meanwhile. He also added about the 12 other projects initiated citing to the development of the city and the state aligned. Stressing at the health care aspect being taken seriously by the masses, Modi said that people worldwide have started accepting yoga as a preventive health care point. Apart from taking medicines, people use these techniques to aid their recovery. The use of generic medicines have also raised in India with the Indian government’s initiative of making generic medicines available at cost less than 50 per cent. Also the Ayushman Bharat scheme has helped the Indian masses financially as well as qualitatively. It is only in 100 days of its launch that more than 6 lakh people have been benefitted by Ayushman Bharat scheme”, he added further. “We are working towards new India. The government reserved 10 per cent for the economically backward sections of the society aligned to jobs and education, which was at first implemented by Gujarat. He further lauded the Civil Aviation Ministry's Udaan (Ude Desh Ka Aam Nagrik) scheme, a regional connectivity scheme that makes flying affordable for masses, saying it will boost development of the country's aviation sector. “It’s my dream to ensure that one wearing Hawai chappal should also be able to travel in a plane”, he said. "I was asked what has been the benefit of note ban decision. You should ask it to the youth, who could buy residential homes at affordable rates after the decision. Black money used to be parked in real estate sector, but with decisions like note ban and RERA, we put a check to it”, Modi said. The prime minister also said that during the last four years of NDA rule, his government constructed 1.30 crore houses while during the previous UPA rule, 25 lakh houses were built. “An LED bulb that costed over Rs 350 earlier, has now be made available at Rs. 50, because of which 16, 500 crore has been saved. The middle class people have been able to save the most”, he said focusing over the middleclass sector of the society.